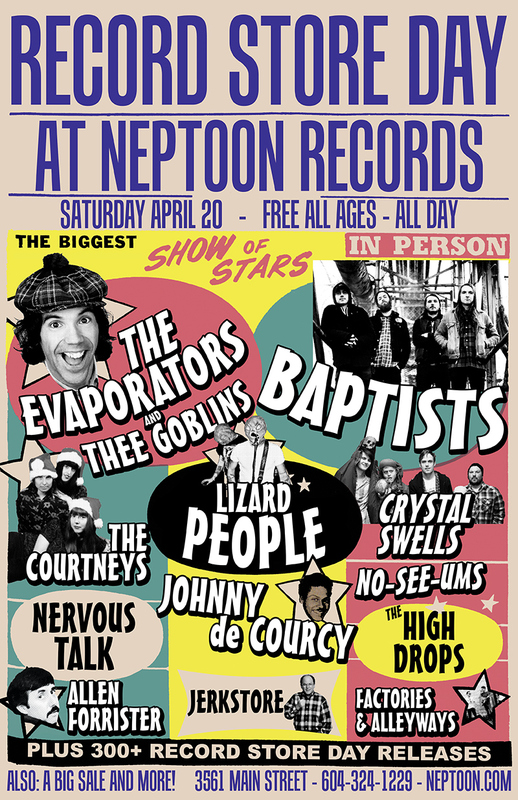 Nardwuar The Human Serviette News: Free Evaporators / Thee Goblins gig on Sat April 20th at Neptoon Records ! 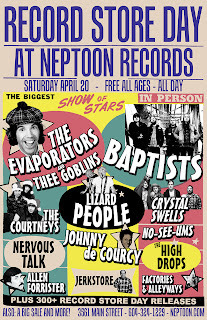 Free Evaporators / Thee Goblins gig on Sat April 20th at Neptoon Records ! On Saturday April 20th, Nardwuar's band The Evaporators (and their mysterious friends Thee Goblins!) will be playing a FREE ALL AGES gig at Neptoon Records﻿ (3561 Main Street) in Vancouver as part of Record Store Day﻿ ! Evaps and Goblins on at 3pm. Facebook Event Page is HERE ! Doot doo ! I don't know if you remember me from SXSW, but I was the tall gentleman with the small camera on his chest. I have the footage of you and wanted you to check it out whenever you get a chance. Your time will not be wasted. My new series that I am working on called "Product of Determination"